New representation center of Altai State University has recently opened up for the applicants in the Kyrgyz Republic. As part of the vocational orientation visit to Kyrgyzstan, ASU delegation and Public Association of the Compatriots Union in Kara-Balta, Jayyl District concluded an agreement. The representation center of the flagship Altai State University will be opened on the premises of the association. In the course of further work with the association, it is planned to organize joint vocational orientation activities telling about the diversity and advantages of education at Altai State University. "Our university has broad experience in work with entrants from the Central Asian countries. Currently, the university has built a broad partner network, which includes support centers and basic schools, public organizations of compatriots and, of course, leading universities of the near-abroad countries. In general, a lot of arguments make entrants choose Altai State University,” Elena Goncharova, Head of the Department for Prospective Students Recruitment at ASU, said. “The purpose of our visit was introducing school graduates of Kara-Balta to the opportunities provided by our university. We talked about the tremendous work with foreign students organized in the framework of AIST International Students Association, presented the leading projects and programs, various forms of active work in the field of science and culture, and so on." During the visit, a meeting with the graduates’ parents was held in Kara-Balta. 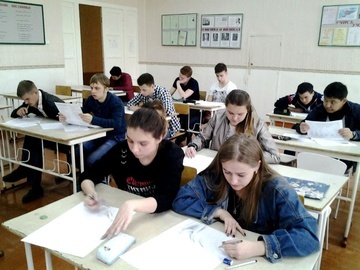 A university competition was organized for schoolchildren, according to which the graduates who showed the best results would be invited to Altai State University to take part in the entrance examinations for further education in the flagship university. About 60 people attended the parents' meeting, and more than 30 schoolchildren participated in the competition. It remains to be added that apart from the representation center in Kara-Balta, Altai State University has such centers operating in the cities of Osh, Jalal-Abad and Bishkek of the Kyrgyz Republic.